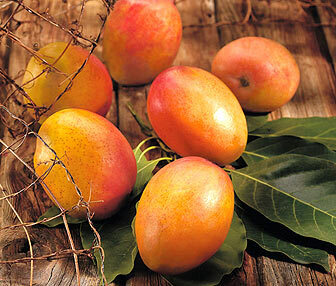 Brought to the West Indies from Southeast Asia, the mango is Jamaica’s most popular fruit. My own personal belief is that no other mango in the world taste as good as a Jamaican mango, and I love me some mangos. Growing up I had mango tree right outside my bedroom window, so it was very easy for me to enjoy them when they were in season. Each year, both children and adults eagerly anticipate mango season in Jamaica. Colorful, sweet and juicy, the mango usually ripens sometime in May and spreads its fruity flavors around the island until July. Enjoy as many of the different varieties of mangoes as you can during your visit to Jamaica during the months of May until July, they just seem to taste sweeter in Jamaica! Now during mango season, roadside vendors offering the juicy fruits in attractively arranged baskets or conveniently packed in bags are a customary sight and the island’s supermarkets offer variety of the pretty red, yellow or green fruit. It is not uncommon to spot mango trees along the roadside, overloaded with one of the many different types that grow on the island. In Jamaica, mangoes grow in every parish, but St. Elizabeth, St. Mary, Clarendon and St. Thomas are known to have crops available in abundance. While St. Elizabeth is said to be the “land of Black Mangoes”, St. Mary produces a profusion of “East Indian”, St. Thomas both “East Indian” and “St. Julian” and Clarendon has a plentiful quantity of the more common “Stringy”.